"American-style ice cream uses no eggs, but this is the French style--with eggs! It's rich and creamy and, although traditionally served soft in cones, I prefer to freeze it firm then scoop it." Whisk egg yolks, sugar, and salt together until mixture changes from dark golden to pale yellow becomes fluffy. Heat milk and cream in a heavy saucepan over medium heat. Stir occasionally to prevent sticking to the bottom. Cook just until mixture starts to simmer when little bubbles begin to appear on the surface, 5 to 8 minutes. Remove from heat. Whisk a ladleful of milk-cream mixture into the egg yolk mixture. Add another ladleful and whisk thoroughly before adding the next (this will keep the eggs from cooking). Gradually add the remaining milk-cream mixture and whisk thoroughly. Whisk in vanilla. Cool completely (you can place the bowl in a larger bowl with ice water to cool it faster). Pour cooled mixture into a pitcher; cover. Refrigerate until ice cold or overnight. Pour custard mixture into ice cream maker and process (according to manufacturer's instructions) until custard reaches the consistency of soft ice cream, about 20 minutes. Quickly transfer to a plastic container. Place a piece of plastic wrap over the surface of the custard. Cover container and freeze until custard is firm enough to scoop, at least 3 hours. You can substitute 1 split and scraped whole vanilla bean for 2 1/2 teaspoons vanilla extract. To cool the custard mixture, I float the mixing bowl in a larger bowl with some ice water. If you want to make ice cream cones with the leftover egg whites, here's a great recipe from Chef John. I didn’t like it. It was too creamy for my taste. It had a great flavor, just too creamy. This was excellent! Very rich and creamy. I added 1/8 teaspoon of xanthan gum to keep the ice cream from crystallizing. It tasted like the best ice cream you can buy (and maybe better). 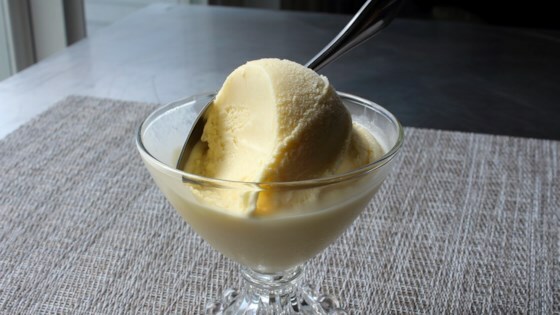 This is my go to for an ice cream (custard) recipe. The family loves it. It does take several hours because you have to chill the mix then freeze afterwards, but it's well worth it. Used 1 cup milk, 1 cup heavy cream, 1 cup sweetened condensed milk and also mango...just delicious!